My all-time favorite snack is chips and salsa. No joke, I could eat a whole bag of tortilla chips in one sitting as long as I have some good homemade salsa. There really isn’t anything much better than easy home cooked recipes. 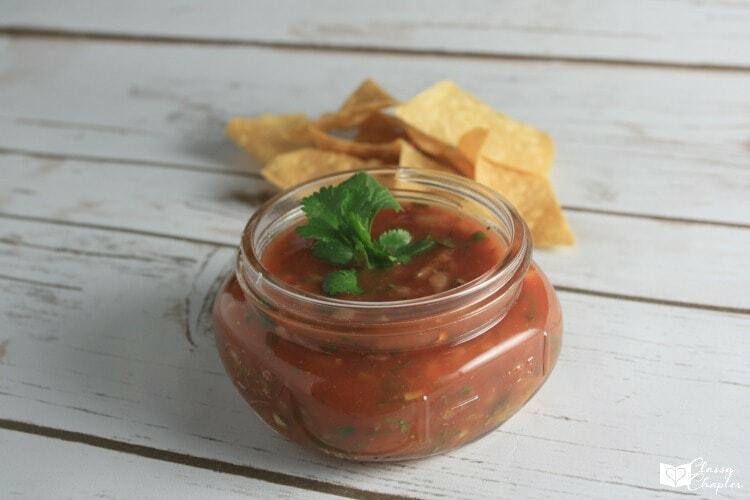 This salsa recipe is so easy to make and has just enough heat. 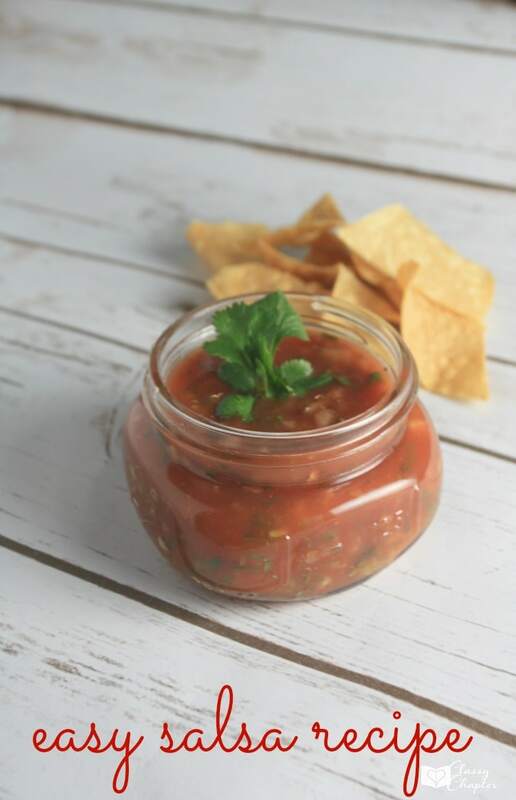 You can make this salsa to fit your own personal taste. Sometimes I’ll make a few batches with varying heat levels. 3. Drizzle oil over your vegetables and sprinkle some salt and pepper over everything. Let the vegatables roast for about 30-minutes or until everything is nice and soft. 4. Set vegetables to the side and let cook for about 15-minutes. 5. Place vegetables in a food processor along with half of the cilantro. Once everything is pureed add in your chipotle chili powder and salt to taste. 6. Mix in fresh chopped cilantro, squeeze some lime juice into the salsa mixture and then refrigerate until you are ready to dig in and enjoy! Tips: You can also roast your vegetables over an open flame, but I find this takes a little bit longer. Also, if you aren’t sure how hot you like your salsa start out by only leaving the seeds in one jalapeno. Looks good! I will have to try this. My kids love salsa! I’ve never made homemade salsa, I’ll have to try this. It looks yummy! It’s so easy and you can make it taste the exact way you want it too. 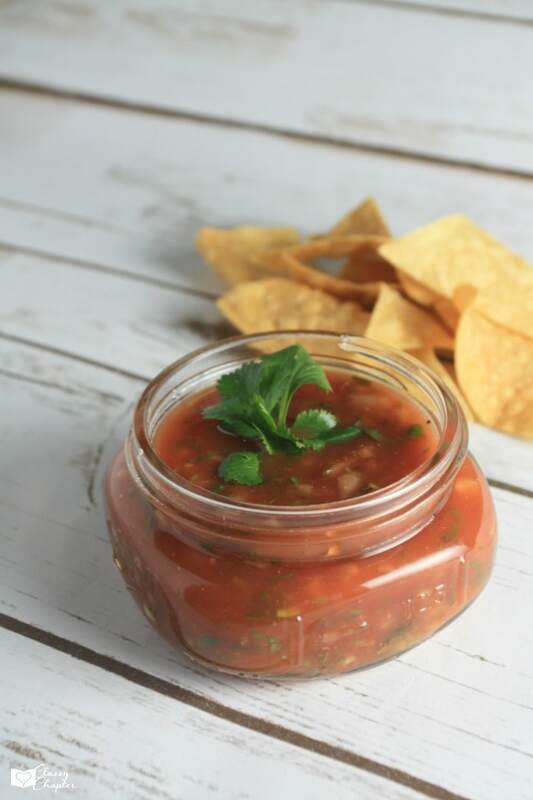 Nothing is better than homemade salsa! I have a similar recipe, but Im going to pin this to try yours out! That looks amazing!! Very similar to my recipe, but I use canned diced tomatoes. I know it’s way better with fresh though anyday! Canned works good too! Sometimes fresh (ripe) tomatoes are hard to come by. I LOVE salsa! I’d eat it everyday, all day if I could. Who knew it was so easy to make. Thanks for sharing!